I’m working back through the McAuley era of Michael Schenker’s career (I started with 1991’s M.S.G.) and Save Yourself is another solid slice of melodic hard rock. I prefer the M.S.G. album but there’s a still a few choice cuts here like the minor hit “Anytime”. It’s easily the album’s best song and is a fine example of what good things could come out of the pop metal genre in the late ’80s. I also like the other two singles this album spawned: “This Is My Heart” is another great commercial rocker and “Save Yourself” is a high energy number. “Take Me Back” was a bonus track exclusive to the CD version of the album and it’s pretty darn good. 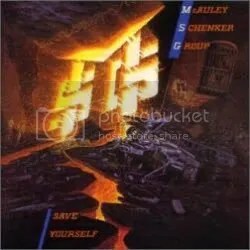 The trend with McAuley Schenker seems to be an effort to fit in with the glossy hard rock scene of the day, thus Michael Schenker seems content to lay low for the most part but the instrumental “There Has To Be Another Way” shows particular fire and reminds me of Schenker’s earlier works. Robin McAuley again delivers a good performance with his gravelly voice. As I mentioned earlier, this album isn’t as good as M.S.G., there are a few songs here I consider filler like “Bad Boys” and “Get Down To Bizness”. Looking at the song titles, you would not be incorrect to assume they are fairly generic pop metal numbers. Still, all told, this is a good album. It’s a shame this group only managed to squeak out a few minor hits, three studio albums and one live release. Robin and Michael made for a good pair. 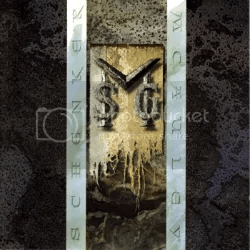 McAULEY SCHENKER GROUP – M.S.G. Not to be confused with the Michael Schenker Group and their own MSG album, this album and the McAuley Schenker Group in general was a mainstream melodic hard rock & pop-metal effort from legendary guitarist Michael Schenker and singer Robin McAuley. I’ve seen some websites treat the McAuley Schenker Group as if it were just another era of the Michael Schenker Group but I don’t feel it is fair to sweep these albums into a larger discography like that. From what I understand, the idea was that this new MSG was more of a team effort than any Michael Schenker Group release previous. really Obviously, the partnership with Robin McAuley meant enough and was different enough to Michael that he allowed his first name to be replaced by “McAuley” in the group’s name (while smartly keep the initials ‘MSG’). The rest of the band is solid: Jeff Pilson from Dokken and James Kottak who originally played in Kingdom Come and eventually went on to join the Scorpions in 1999. I wonder if Michael recommended Kottak to his big brother Rudolf? Though I’m not the biggest Michael Schenker fan, I’m surprised by how little I knew of this band. I remember coming across their name before but never dove too deep into it. Luckily, Stone over at Metal Odyssey did a post that got me really interested in the band. A few YouTube searches later and I was HOOKED on this album’s final song “Never Ending Nightmare”. It’s an epic ballad. Skip ahead a few months and I found a used copy of this album on Amazon.com for only $2.98! Plus shipping it was a grand total of $5.96! It was money well spent because I am thoroughly enjoying this disc. Second only to “Never Ending Nightmare”, “Eve” is fantastic and pure pop-metal with what is the catchiest chorus of the whole album. I know this band had minor hits with “Gimme Your Love” (from 1987’s Perfect Timing) and “Anytime” (from 1989’s Save Yourself) but “Eve” should’ve been HUGE. This album is a lost classic in my eyes and may be one of the last great albums from the glory days of pop-metal and melodic hard rock. I’ve heard bits & pieces of Perfect Timing and Save Yourself and judging from what I’ve heard, I think M.S.G. is the band’s finest moment. It’s just too bad it would be their last moment as Robin and Michael parted ways in 1993.